This undated image released by National Geographic Channels shows a Hutterite community near Lewistown, Mont. “American Colony: Meet the Hutterites,” is a National Geographic ‘reality’ series about a small religious community in rural Montana. I have spent days thinking about it and finally decided to go for it. I will be producing an episode-by-episode personal reflection series based on the ‘reality show,’ American Colony: Meet the Hutterites, directed by Jeff Collins and aired on the National Geographic Channel. When we first learned of the show, I helped put together a general response to be posted on hutterites.org, but it has become evident that a deeper exploration is possible, if not required. I have seen the first three episodes. I will review each episode, choose what I believe to be the major themes, and respond from a Hutterite perspective. The view will be my own, and not everybody may appreciate it. My exploration may be too cerebral for some tastes, but that is my temperament and all that I can offer at this point. And as we discuss ideas, my views may change–that is why we must do this: to learn from each other. My approach to these issues will probably not bring any solid answers, but as we fumble with this Rubik’s Cube, I hope some insights and understanding will result. When challenges of this type arise, they present us with the opportunity to reflect on what we are doing well, but also call us to think about where we are struggling. And we do struggle. I am committed to working hard at being gentle, gracious and non-judgmental. This may not always be possible. Kyrie eleison. I will ‘air’ my general thoughts here in this post. They will be added as they unveil themselves/rear their ugly heads, so check back occasionally. I welcome your questions, specific and general, regarding the show here in this post. In case you are wondering, the two most popular films are To care and not to care: The Hutterites (1984), directed by Burton Buller and The Hutterites (1964), directed by Colin Low. Both of them are dated, but still warrant a viewing. In addition to these documentaries, there was even a movie (yes, a movie!) made on a Hutterite community in the 1940s! Parallel 49 was filmed in 1940 and released in 1941, even predating the documentaries. In my training as an adjudicator I have always been coached to focus on ‘three stars and a wish’. Here is my first star: This show has initiated a dialog among our people. I hear young people talking about what it means to be a Hutterite. I hear Prediger confessing that we are not perfect. Some people say the show makes them uncomfortable because some things are as they see them; others are dismayed at the divide they see between their Hutterite reality and the one the show portrays. So, even from a distorted reality show, good things can emerge. Perhaps the most disheartening aspect of American Colony for me personally is not the series itself, but some of the reactions to it that I encounter. What irks me most is the indulgence in Schadenfreude by former Hutterites. I have heard several variations of, “There have been enough documentaries made to show how Hutterite life should be, now finally there is one that shows it how it really is.” I can’t even seem to find adequate words to describe the negative emotions that rise up in me; as far as I can tell it’s a strange concoction of pity, humiliation, anger and compassion. I have to firmly tell myself that we all have to come to grips with ‘where from’ and ‘how’ we have come to the place we stand now; I admit I would much rather firmly tug their ears. Yes, we have some rough characters, but we also have many gentle people. I fully realize that some people don’t want to live in a Hutterite community–and they shouldn’t; I give them credit for making the decision to leave–but if we can’t abide in christian forbearance, let us at least not forget basic human decency. That said, if the hurt and bitterness that I sense is caused by poor leadership, broken relationships where leaving was the only way out, or anything of this sort, I am truly sorry for your pain. Pax vobiscum! 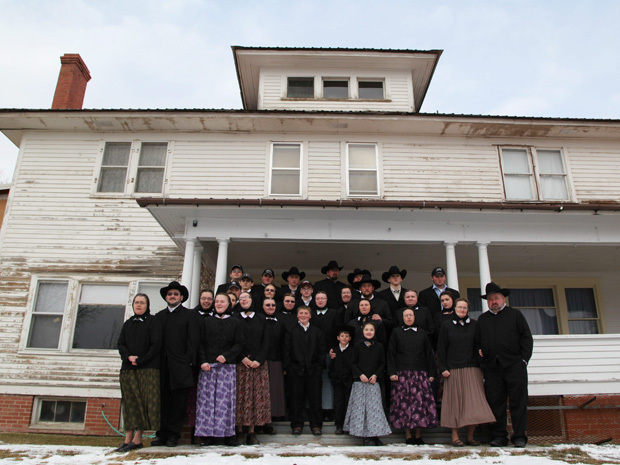 Categories: Reflection | Tags: American Colony, Hutterite, hutterite community, Kenny Wollmann, Meet the Hutterites, national geographic channel | Permalink. Oh yes indeed, many have no problem watching Prison Break, Lost, or American Idol, but somehow this show tweaks their conscience! Ah human nature…you are indeed strange! I can’t bring myself to watch anything from this show. It may seem as if I’ve got my head in the sand but, as you wrongly suggest, it has nothing to do with “watch(ing) other shows of equal or lesser moral standards”. I don’t think my decision has anything to do with the show’s lack of moral and ethical standards. Unless you’re referring to the producers of the show but that’s another issue entirely. I cannot help but feel this show is demeaning and taking advantage of the King Ranch families, who I believe had no idea of the implications of their decisions. For me watching the show would be like watching one’s relatives self-destruct. I simply can’t handle that. I certainly can’t watch it for its entertainment value because I find it sad beyond measure. I listened to the audio of one of Bertha’s conversations and thought. Hmm, this is just a woman who is sending her children to an outside high-school. This choice seemed rather unusual and rebellious and I couldn’t understand why she stayed in that community. My second train of thought was about the language, ‘why is she speaking in complete English instead of her mother tongue of Hutterisch?’ ‘Would she really speak that way in Hutterisch?’ ‘Couldn’t her words, as she spoke with her children or with other members, have just been translated on the screen?’ ‘How does NatGeo deal with languages on their other shows?’ ‘Was any consideration given to speaking in their Hutterisch tongue and first language?’ My third thought was, ‘I wonder about her role and standing within the community? Needless to say I was left reeling when I heard that she has the prominent role as the head-cook in that community. My disappointment was heartfelt. I didn’t know how think about the leadership and values in the community of King Ranch! I’m a teacher in our colony and every aspect of my life I’m cognizant that I’m supposed to be a role model in our community and uphold the standards and values we profess. And I hope and pray that if I’m not upholding the standards of our community then I would be removed from that job. I simply can’t reconcile what’s happening in King Ranch with what my life is like. That is not the Hutterite lifestyle that I know and love. So to the young people who choose not to watch, I’m with you. I cannot watch something that makes me feel this badly about the Hutterian culture. And to those who are watching and laughing, my sympathy. Lastly to those who choose to watch and use this as an opportunity to make your communities better and who choose to use this as an opportunity to educate, I commend you. With due respect, you are critical of Bertha not speaking in her “mother tongue” Hutterische. Why, may I ask, are you not writing your comments in your “mother tongue” Hutterische? Think about it. I’d like to enter the discussion. My wife, our son, and I are viewing the show with great interest. Let me begin by saying I am a former “child of the Bruderhof”. The Bruderhof and the Hutterites once were linked. They have gone separate ways, the “unity” is broken, and the hope for reconciliation has dimmed over the years. Let me make it clear that the reason I left the people I loved and the communal life I wanted to commit to, is because of the evils I personally witnessed within the system. The courageous voice of protest often is drowned. Change is difficult to come by. Viewers will either hear the cry of concern in Bertha’s words, or dismiss her as a disgruntled widow. I think some people are called to be “rebels”, in order to keep other communitarians honest. This, as I see it, is the role Bertha, Claudiamfr and Wesley play. But notice this: even as they question the status quo they want to remain faithful Hutterites. Every community, every colony, needs courageous rebels to stir the embers and keep the fire burning. All too often rebels are kicked out; marginalized and shunned. Something is wrong…sigh….and only a few will “get it”. A prophet is not welcome in his home town. I want to support Hutterites everywhere! I want to respect their way of life. I am not here to point fingers. I am here to ask, seek and knock. I am here to be honest. I joined the Hutterite Social Network in the hope of initiating honest dialog. What I found was than many of its participants wanted to trumpet only to the Good that Hutterites do. They seemed unwilling to explore the needs. I believe that honesty demands that we open ourselves to explore all aspects of institutionalized religion. Jesus was and died a Jew. He was not a Christian. He did not found the Christian Church. His was a grass roots effort that, as he hoped, would grow like a mustard seed. I believe institutionalized religion is anathema to the message of Jesus. In this sense, open and honest dialog is the only way we can deal with institutional evils. The TV show does not speak for Hutterites at large. The producer said so. Rather, it is a reflection of what happens when a colony finds itself on the fringes of larger Hutterdom. I would gently suggest that the show can serve to foster restorati mfrve dialog amongst Hutterites. Remember Hutterites do not have television (not allowed), so most will never see the documentary. I agree. Most Hutterites do not have direct access to TV. But, a large number of Hutterites have access to the Internet often with their own email addresses. (I communicate directly wiht German teachers and ministers in Dariusleut and Schmiedeleut colonieson a ferquent basis who have direct acces to the internet via the servers in their own colony schools.) Just visit any public library in southen Alberta or in the Portage la Prairie, MB or Aberdeen, SD areas and you’ll almost always see quite a few Hutterites at the computer terminals.The Natonal Geographuc Society provides numerous short film-clips from all of its episodes–and they have done the same with the “American Colony” series. Bertha is a gem! She ooozes sincerity. She is charming. She appears to be a wonderful kitchen boss, whom the other women are only too eager to have back (after the shunning). Bertha is candid in revealing her own pain loosing her husband to suicide. She is remarkably open about the challenges of raising her teenagers alone. There is a wisdom about her words and her conduct that I find appealing. I want to know why she thinks a high school education is so important for Carver. Does she sense that he will not stay on the colony? Did Claudia, whom she wants to remain with her, get access to post 8th grade education? Claudia, no doubt, is a bit selfish. It’s a stage of life that will pass. Mother and daughter are, in my opinion, a breath of fresh air in what might otherwise be a stale communal life of expectations and obligations. Every colony, every Bruderhof, every clan, needs a Bertha or two to keep the rest of the other communalists honest! This, I believe, is Bertha’s primary GIFT to her colony. Remember this, behind her “stiring the pot” -an apt metaphor, eh?- beats a heart of gold. Don’t judge her only by her apparent “rebeliousness”. Rather, try to understand “the heart of the matter”.